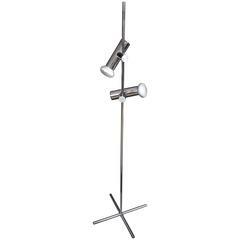 Newly produced in Italy - architectural desk lamp in the style of Gino Sarfatti. Newly rewired. 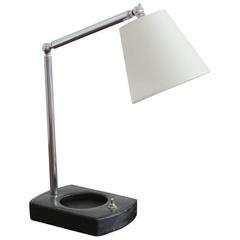 Jacques Adnet style desk lamp in black leather with new silk shade. Polished chrome articulating arm. Professionally rewired. 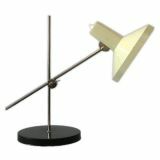 Italian desk lamp with heavy brass counterbalance weight, black cone shade that lights up and down. 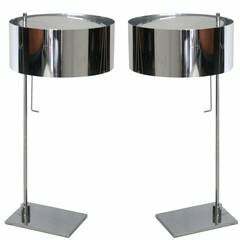 Elegant pair of chrome and Lucite desk lamps. 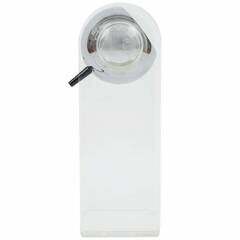 Rectangular base and round dome shade with Lucite diffuser. Newly rewired. 4 pairs available. Priced as a pair. Petite French desk lamp attributed to Jacques Adnet. Unique blue leather. Newly rewired with new shade. 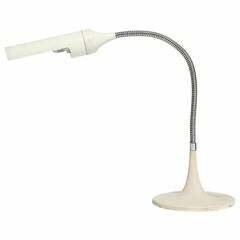 A desk lamp having a sculptural white textured enameled pedestal base supporting a chrome gooseneck stem and cylindrical shade. 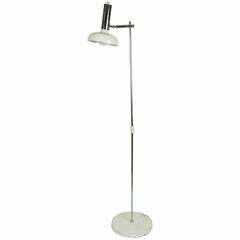 Arteluce style floor lamp with the pivoting lampshade and adjustable height.